Installation of mixed media drawings, objects and sculptures. 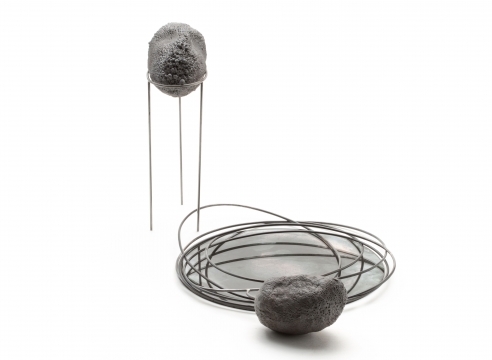 Installation on table; mirror drawings, sculptures of steel and steel with wax, foam, wood box. Framed drawing on paper, 2015, 13.5 x 10 .5 x 1.6"
Installation with Mirror-Portrait and standing sculptures. Standing sculptural mirror box within box, wood, stockings, sand, bird nests, 2014, 24.5 x 24.5 x 55"
Embroidery drawing, textile, thread, ink, 2016, 12 x 12 x 1.5"
Embroidery drawings, textile, thread, ink, 2016, each 23.5 x 12 x 1.5"
pendant, 2016, carved horn, brass, 3 x 2 x 2.25"
pendant, 2016, carved horn, brass, 3.25 x 3 x 2.35"
pendant, 2016, carved horn, brass, 4.75 x 3 x 2.5"
The objects, drawings, mirrors, and embroidery constituting the series “real" defy any form of hierarchy. They loop into and mirror one another and themselves, questioning the reality of objects as such. Moreover, all the elements of the installation are empty, offering rather than occupying space. As such, they evoke a sense of sheer presence rather than representing anything else. At the same time, the very absence of the portrait and the different tactile and visual qualities of the craft media materialize more than an image. With “real,” Iris Eichenberg has created a series of work that plays off mantelpiece objects and the portraits arranged on the wall behind them. She expands this landscape, enveloping us in it. The objects serve to elicit experiences. It is as if we have double vision—is it a single thing we are looking at or a multitude?, a portrait of an individual or of a totality?, a drawing or an object?. The dizziness blurs our understanding. The perceptual experience forces us to ask what is real and what is not: what is an object, a person, a frame, a space? What moves and what is motionless? What makes space and what takes up space? What defines us and how do we define ourselves? Each object in the series is a moment of encounter. Cushions, drawings, frames, and stands all point to the presence of an absence, create the space for a void which echoes the dialogue between the objects. The viewer’s participation in the installation is offered a space to exist in the emptiness. The series questions realness because the group of objects constitute a drawing, a reflection, not any thing in itself. Each object questions itself by being paired to others—always moving between itself and the others, and/or between different materialities, e.g. between its wax version or the steel. The group is in dialogue with itself. Not an image but the experience of a portrait.